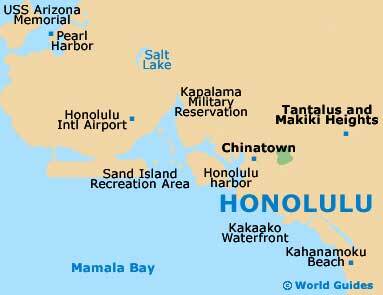 Honolulu is Hawaii's biggest and foremost shopping city and you will find anything and everything among the city's huge malls, arcades, fashionable boutiques and local craft shops. Shopping for authentic Hawaiian souvenirs is a pastime in Honolulu and there is no end of quality local products. 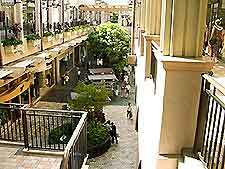 The major malls in Honolulu open daily from 10:00 to 21:00. Smaller district stores generally operate from 09:00 to 17:00, although variations may apply, with some stores opening at 10:00 and closing as late as 21:00, as well as possibly closing for lunch. Honolulu has a good variety of retail opportunities spread around the Central Business District (CBD) and near the harbor and beaches. There are several major shopping centers within the city boundaries, containing more than 1,000 stores in total. This popular shopping center has a superb location next to the Honolulu Harbor and its two-story structure is loaded with stores featuring clothing, art and jewelry. 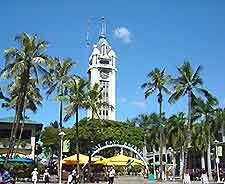 Additionally, the Aloha Tower Marketplace has numerous restaurants and live entertainment, as well as the Aloha Tower, which can be visited free of charge for amazing views over the harbor. For some serious spending in Honolulu, the Ala Moana is a massive open air mall with over 200 stores and a multitude of restaurants. Attractions here include many of the world's most fashionable and well-known boutiques, such as Gucci, Louis Vuitton, Gianni Versace and all major department stores. The likes of Cartier and Calvin Klein have boutiques here along with many other world-class designers. The DFS Galleria famously houses Hawaii's largest beauty and cosmetic store and boasts an entire floor devoted to duty free items, as well as being a good venue for those with a fancy for high fashion and arts and crafts. With free shuttle service available from Waikiki, Hilo Hattie is a must-see store, especially if you are after some colorful Hawaiian fashions. Hilo Hattie is the world's largest manufacturer of Hawaiian fashions, ranging from cool to classy looks, and is also known for its huge selection of island souvenirs. The Chocolate Company, where the likes of Kona coffee and macadamia nuts are dipped in delicious chocolates and boxed, is known for its gourmet chocolates. Only the finest Hawaiian flavors can be had here. This new three-story shopping center oozes quality and houses such famed and fashionable boutiques as Yves Saint Laurent, Gucci, Chanel and Tiffany and Co; an intriguing bronze statue adorns the front of the center.